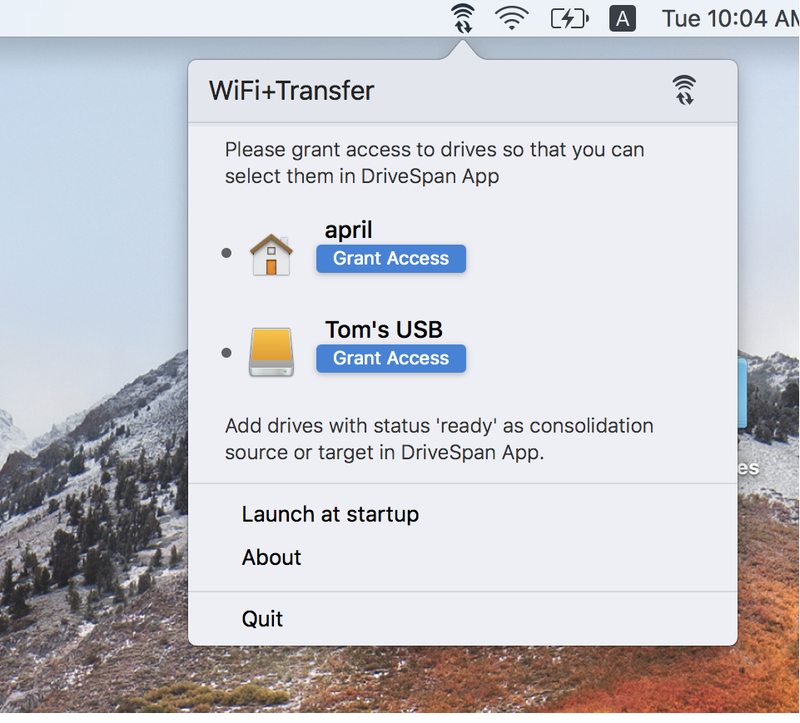 What is ‘WiFi+Transfer’ for the Mac and how does it work in connection with ‘DriveSpan App’? ‘DriveSpan App’ on your mobile device is the central control unit for connecting sources and a target wireless to your consolidation scenario, and for executing the consolidation. 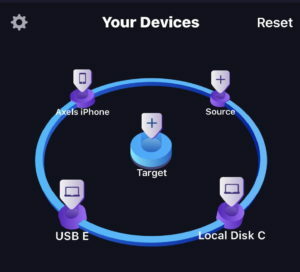 If you are making use of a Mac including internal and attached external storage, ‘WiFi+Transfer’ is in charge of connecting and exchanging data between your Mac (wireless or via LAN) to DriveSpan App running on your mobile device. Make sure your Mac is switched on and uses the same network as the mobile device, on which ‘DriveSpan App’ is running. Press on the add source symbol on DriveSpan home screen and in the device selection window, select your Mac. Press on the Mac name listed here. If the permission to connect to this Mac was not set so far, ‘DriveSpan App’ will send a 6-digit access code to your Mac. Type the given PIN into the interface showing at ‘DriveSpan App’ and press ‘Access’. Your Mac is set for connecting with ‘DriveSpan’, now. If you are using the same Mac ever so often in connection with ‘DriveSpan App’ on the same mobile device, you will not have to enter the PIN, again. 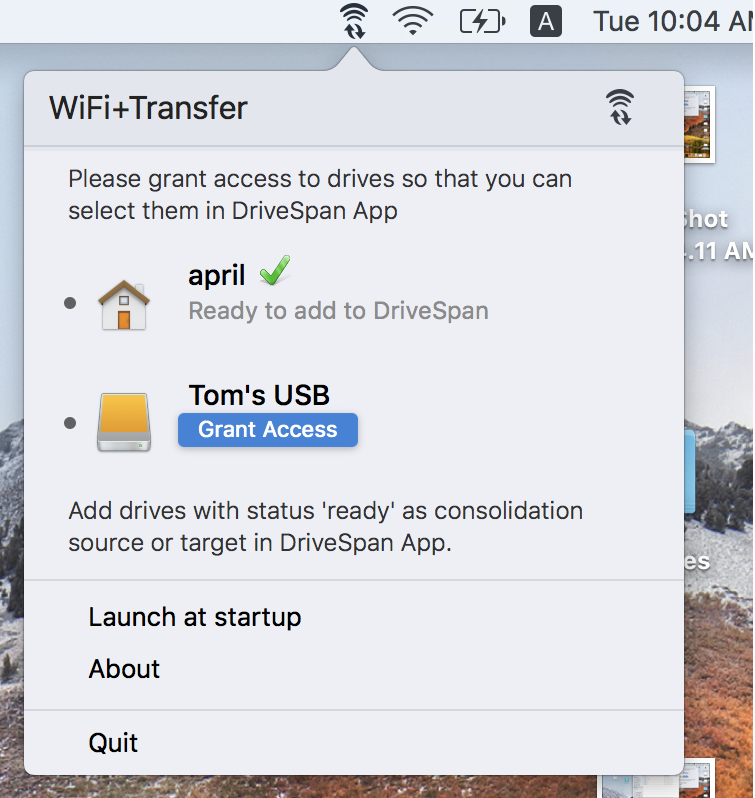 If you want to select internal partitions or attached drives in your Mac for consolidation with DriveSpan App, WiFi+Transfer needs to grant permission for your Mac system, so that you can add the respective drives as a source or target for consolidation in a second step within DriveSpan App. 1. Click on ‘WiFi+Transfer’ tool showing up at the top of your Mac Desktop. WiFi+Transfer will list available internal or external drives. Click ‘Grant Access’ to the device that you want to use for consolidation – in our example we selected the personal Mac folder ‘april’ . 2. The Mac Finder will open with the prior selected drive auto listed. Click ‘Grant Access’ again to finally approve the selection. 3. WiFi+Transfer tool will show you the approved device for consolidation, now. 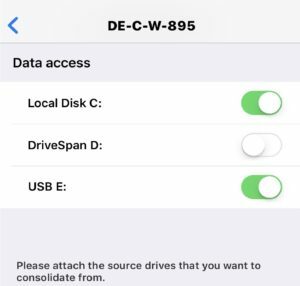 Within Drive Span App on your mobile device you can now add the granted drives as a source or target for your consolidation. 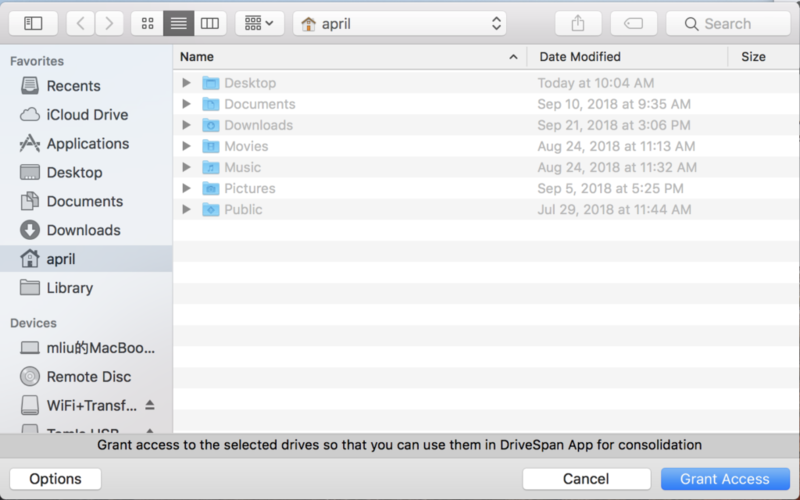 If you do not change the drive setup in your Mac, next time you integrate your Mac into the consolidation with DriveSpan App, no further action is required. What is ‘WiFi+Transfer’ Tool for the PC and how does it work in connection with ‘DriveSpan App’? 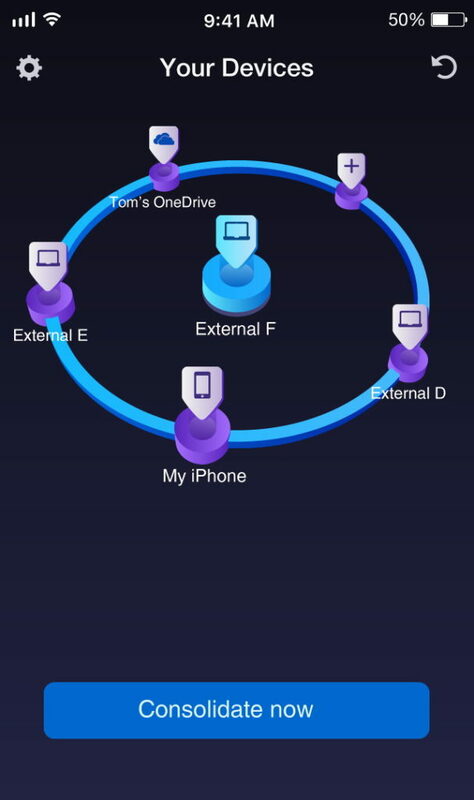 If you are making use of a PC* including attached external storage, ‘WiFi+Transfer’ is in charge of connecting and exchanging data between your PC (wireless or via LAN) to ‘DriveSpan App’ running on your mobile device. Make sure your PC is switched on, and both your PC and your mobile device running ‘DriveSpan App’ are logged in to the same network. In ‘DriveSpan App’ source or target selection (also see Nero KnowHow 00144) click on the listed PC. 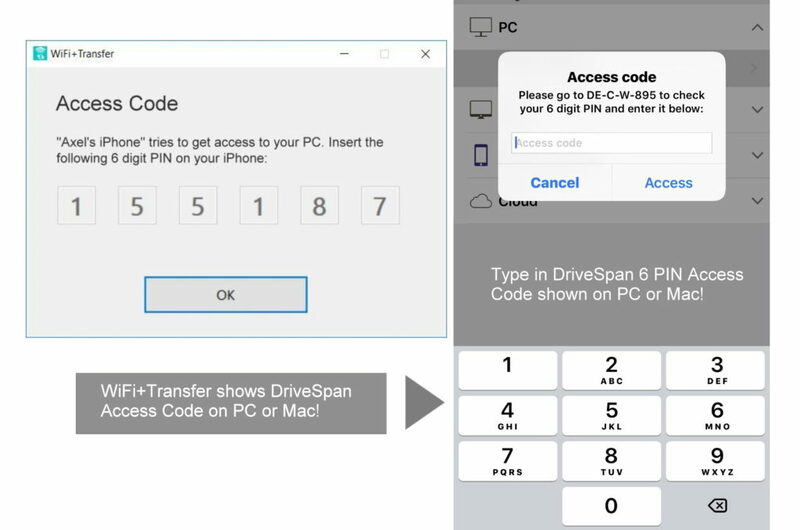 If not set permission to this PC yet, ‘DriveSpan App’ will send a 6 digit access code to your PC. Type the given digit into the interface showing at ‘DriveSpan App’. Your PC is set for connection with ‘DriveSpan’, now, and if you are using the same PC ever so often in connection with ‘DriveSpan’ on the same mobile device, you will not have to enter the PIN again. Once done, you can access all internal and external drives (connected to your PC) and set them as a source or target for consolidation. Integrating a PC into the consolidation requires ‘WiFi+Transfer’ installed on the respective computer. If you are using ‘Nero Platinum 2019’ or ‘Nero Standard 2019’ (or later versions), ‘WiFi+Transfer’ was already installed on your PC together with the ‘Nero Suite’ installer. So, you are set to use all ‘DriveSpan App’ features also with your PC. Free ‘DriveSpan’ version users can buy the option to consolidate via PC or Mac. To utilize this make sure to have ‘WiFi+Transfer’ installed on the PC and/or Mac. A free PC version of ‘WiFi+Transfer’ tool is available for download at www.drivespan.net. A free Mac version of WiFi+Transfer is available via Mac App Store. For a demo video of DriveSpan App check Nero KnowHow 00154. How can I add ‘Sources’ and a ‘Target’ for Consolidation to ‘DriveSpan App’? The status of added sources and the target will be shown on the ‘DriveSpan’ user interface. 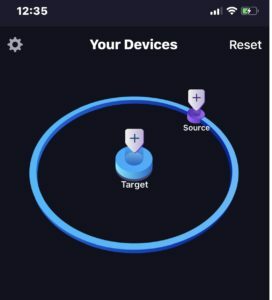 On the home screen, you find an intuitive representation for sources to be added within the outer ring and a target to add in the center. Initially, please make sure that all devices including sources and target are logged in to the same network: mobile device, PC and Mac. 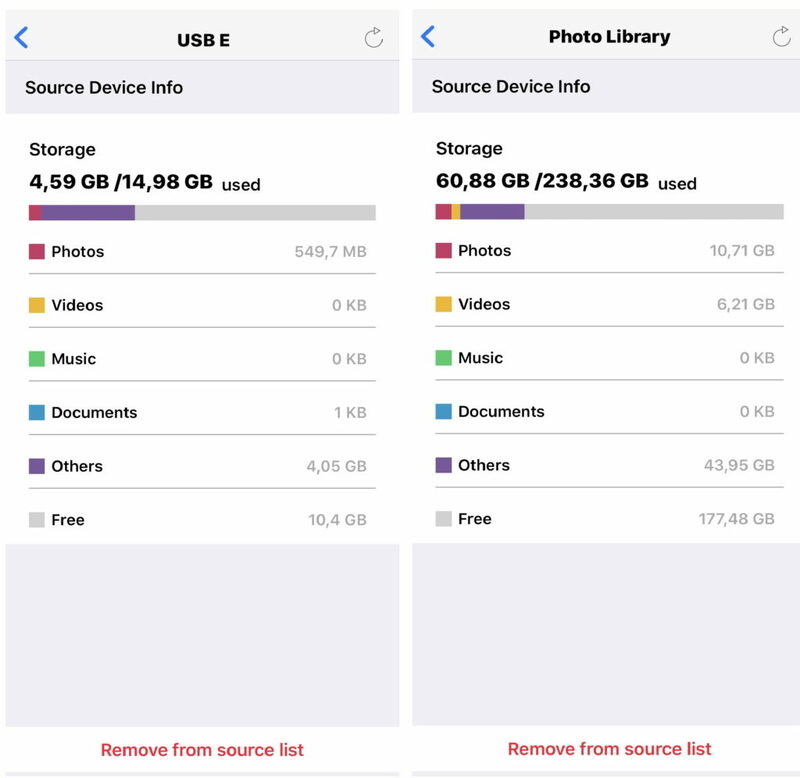 Also, please do not forget to connect external storage devices that you want to use as source or target physically to your PC or Mac, e.g. your USB sticks or external storage drives. For adding a source, press the plus button. The next page will show all available sources/devices in your network that you can use for consolidation. 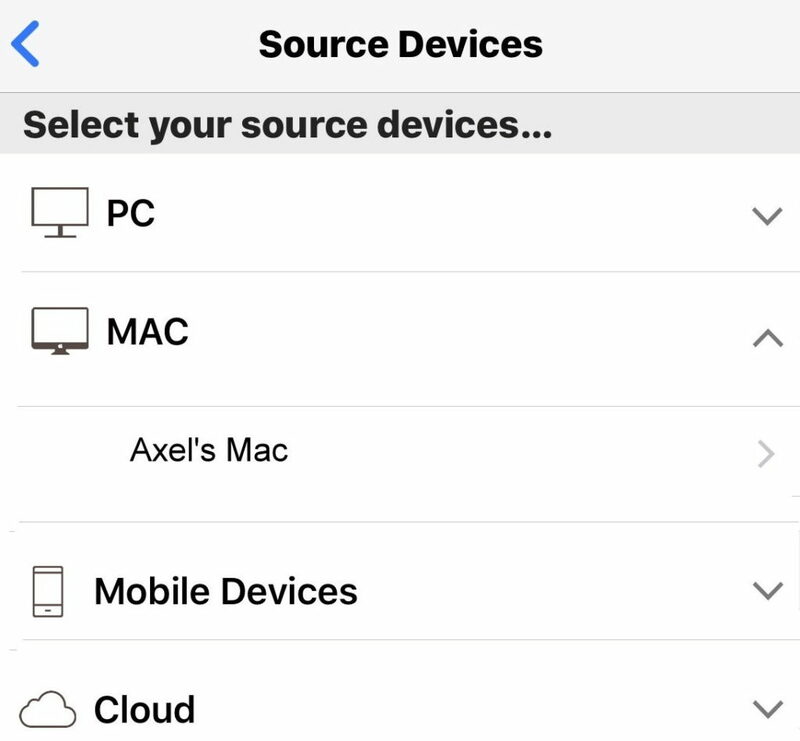 Press on the respective source device and a selection option will open. Make sure your PC or Mac is switched on, your PC or Mac uses the same network as ‘DriveSpan’, and ‘WiFi+Transfer’ is installed on your PC or Mac (check details below). In the window select your PC or Mac. We are using the example of a PC – a Mac will work accordingly. Press on the PC name listed here. If the permission to connect to this PC was not set so far, ‘DriveSpan App’ will send a 6 digit access code to your PC. Type the given PIN into the interface showing at ‘DriveSpan App’ and press ‘Access’. Your PC is set for connection with ‘DriveSpan’, now. If you are using the same PC or Mac ever so often in connection with ‘DriveSpan App’ on the same mobile device, you will not have to enter the PIN again. 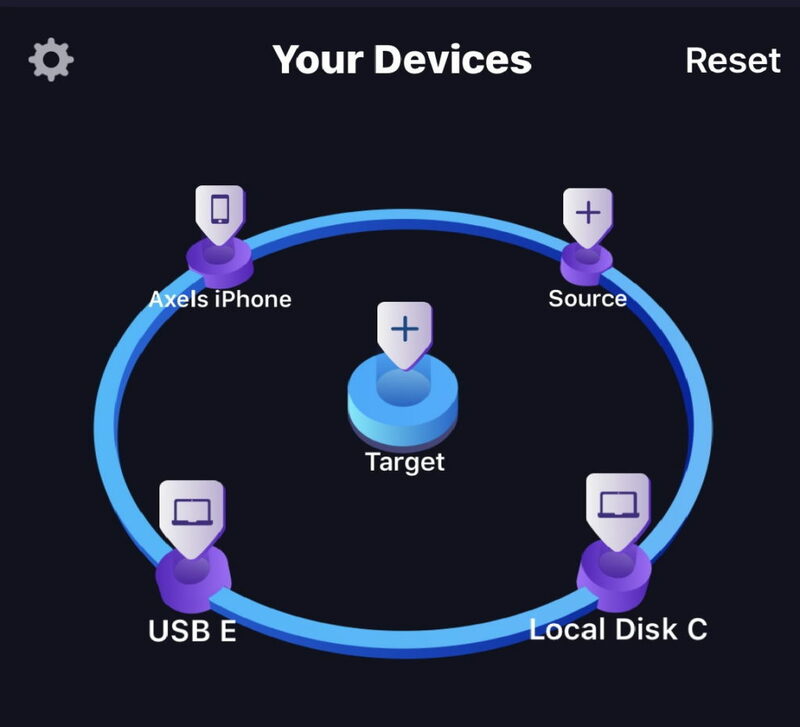 Once done, you can access all internal and external drives (connected to your PC or Mac) and set them as a source (or target: see further down) for consolidation. When selecting ‘Mobile Devices’ the mobile device, on which you run ‘DriveSpan App’, will be shown by default. Press on it to select it for integration into your consolidation scenario (see device selected in above list). Note: After the initial release version of ‘Drive Span App’, you can expect an update allowing you to add more than one mobile device to your consolidation setup (stay tuned via Nero KnowHow). 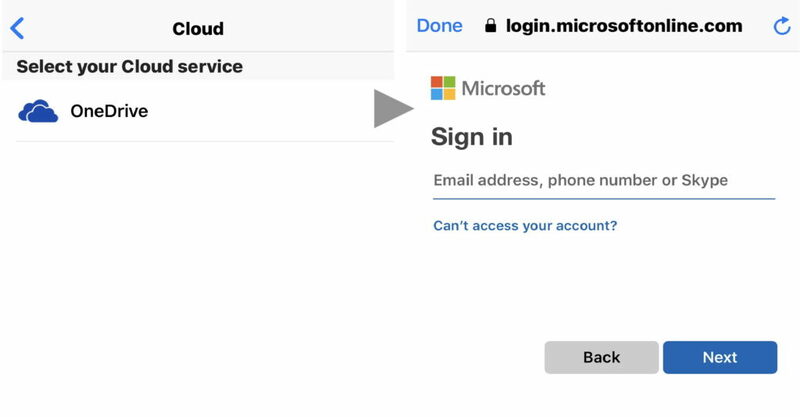 If you are using a cloud service like ‘OneDrive’ (support for further services planned), you can select it and directly log into your account via DriveSpan App. When all your sources are set, go back to the home screen where you will find them indicated by name in the outer ring of ‘DriveSpan App’. If wanted, add more sources by pressing the ‘Source’ plus, again. You can check the status of each source by clicking on the respective icon. 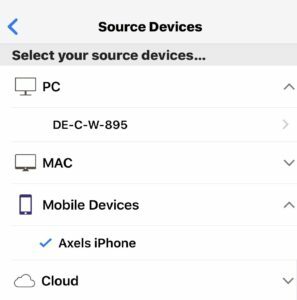 At the bottom of this screen, you can also remove the source from your list of devices. The same is also possible on the home screen via long press on the respective source icon. Now, press on the target icon in the center and add one target. This can be your PC or Mac, an attached external storage, or a cloud service. You cannot consolidate to a mobile device. In the case shown below, the target is an external PC storage drive under D:, that we have named ‘DriveSpan’ for the sake of showing it in this FAQ. Target status control and removing behavior works exactly like with the source setup. Please make sure not to select a target device that you initially selected as a source device. This will not work. When your target has been selected, you are ready for consolidation. Press on the button ‘Consolidate now’ at the bottom of ‘DriveSpan App’ to start your consolidation. If you want to cancel the whole source and target selection, in order to do the setup again, just press ‘Reset’ in the home screen top right. Integrating a Mac or PC into the consolidation requires that ‘WiFi+Transfer’ is installed on the respective computer. A free PC version of ‘WiFi+Transfer’ tool is available for download at www.drivespan.net. A free Mac version of ‘WiFi+Transfer’ tool is available via Mac App Store. With the free version of DriveSpan App you can consolidate into your OneDrive cloud. 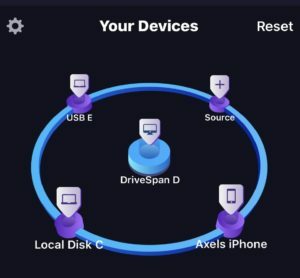 If you want to store all your stuff on a hard disk or a NAS attached to your Mac or your PC, DriveSpan requires an In-App-Purchase. If you are using ‘Nero Platinum 2019’ or ‘Nero Standard 2019’ (and later versions), ‘WiFi+Transfer’ tool was already installed on your PC together with the ‘Nero Suite’ installer. As an owner of Nero Suite 2019 & later the feature to use your PC as a target for consolidation will be unlocked automatically – i.e. you get the In-App-Purchase for free. Check below table as a reference for using sources & targets. 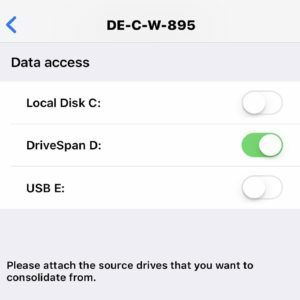 What is ‘DriveSpan App’ and what can it do for me? Via ‘DriveSpan App’ in combination with your Nero Suite product (Nero Platinum 2019 or Nero Standard 2019 and later) you can easily merge and consolidate all of your media and data located on your mobile device, on your PC with internal and attached storage, or within the cloud to one central storage location, e.g. a PC, an external hard disc, or the cloud. Via ‘DriveSpan App’ for iOS and Android you can now comfortably control and trigger the consolidation with all devices simply connected via the same WiFi network. When the consolidation is finished you will find all of your data on the central storage location in a clean state, i.e. duplicate media and data are being identified within the consolidation process and will not be copied. Nero Suite users (Platinum 2019/Standard 2019 and later) have access to the complete version of ‘DriveSpan App’ with all features enabled (except Mac access). The free version is restricted to consolidation from mobile and cloud to cloud, only. Other users that do not own one of the Nero Suites (version 2019 and later), but want to include their PC and even their Mac into the consolidation can buy this feature via In-App-Purchase. The free ‘WiFi+Transfer’ tool needed for connecting a PC and attached storage to ‘DriveSpan App’, can be downloaded via www.drivespan.net. Mac users get the free ‘WiFi+Transfer’ tool needed to connect their Mac and attached storage to ‘DriveSpan App’ in the Mac App Store. As a Nero Suite user (version 2019 and later), you will have the ‘WiFi+Transfer’ tool for PC consolidation already installed with your product. So once you start ‘DriveSpan App’ on your mobile device you are ready to enjoy consolidating. For more details, also see Nero KnowHow 00144.